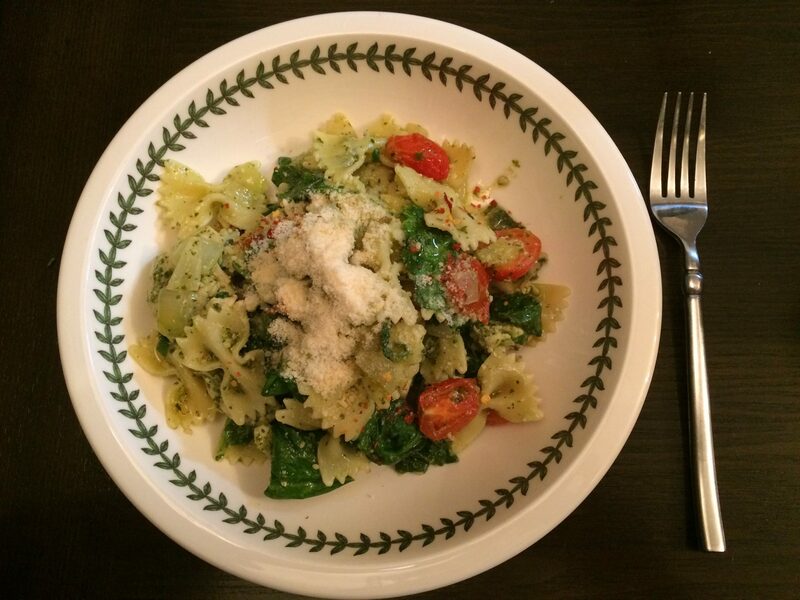 Basil pesto chicken pasta is quite simply one of the easiest nutrition rich meals that you can make in a flash. These two crucial steps will make sure that the chicken and pasta come out perfect. Who knew that simply throwing together chicken and pasta with sauce would result in a sensational meal. My wife and I created this recipe together. She wanted to try basil pesto with chicken. I wanted pasta. 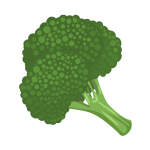 She wanted more nutrition in our meal, so she wanted green vegetables — spinach. I wanted it to be more interesting with color and flavor — tomato. It was one of those moments where we bounced an idea back and forth, and created something new together. It was an energetic moment where the pieces of this recipe just came together. 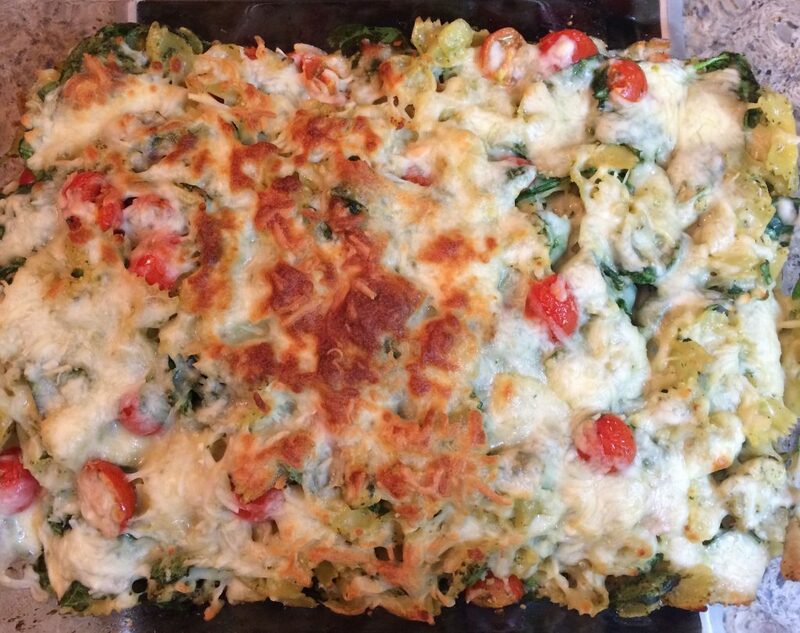 We now make this recipe often and for a pasta dish its packed full of nutrition. 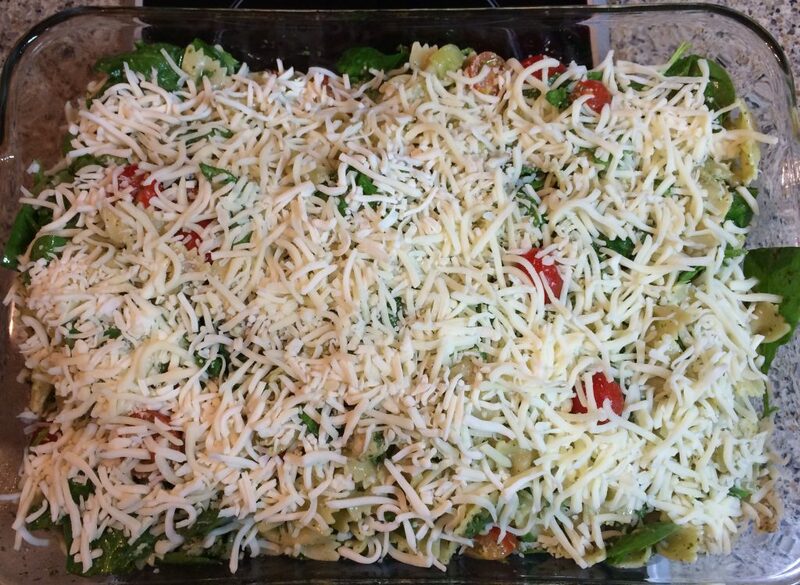 When making this recipe you want to try to time the making of the pasta, chicken, and onion to be finished cooking all at the same time. You want the ingredients hot, so when everything is mixed together and goes in the oven that the oven baking time can be kept to a minimum. You don’t want to over cook the spinach or tomato. If the spinach is over cooked it will wilt too much and if you over cook the tomato it will become mushy. 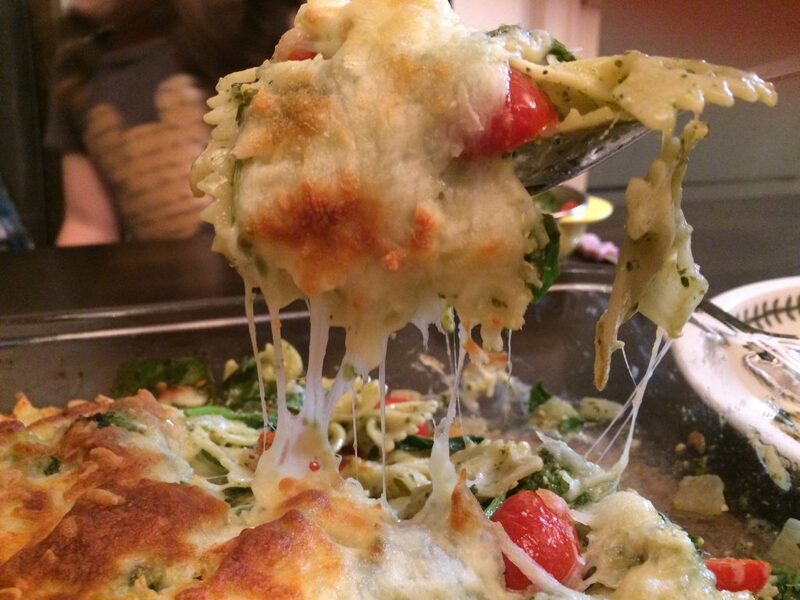 You want the spinach to be slightly limp when you combine with the pasta and chicken. Which is why I recommend that the spinach is par-cooked in a hot water bath. 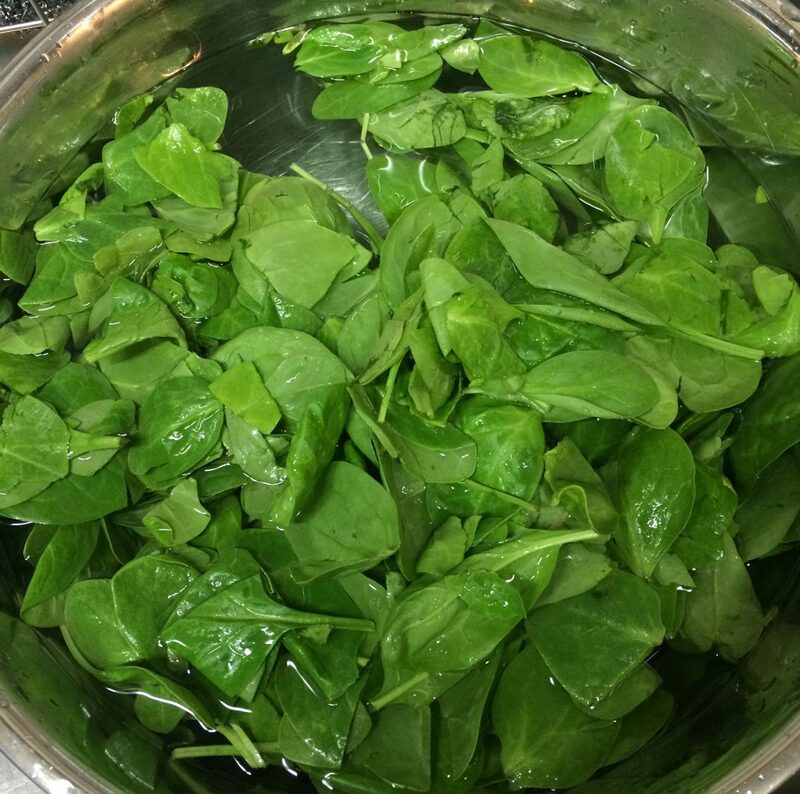 If you try and bake the spinach raw the spinach will dry out and be unpleasant. Finally, when you put the dish in the oven to bake, only bake it for about 15 minutes to brown the cheese and remove from oven. 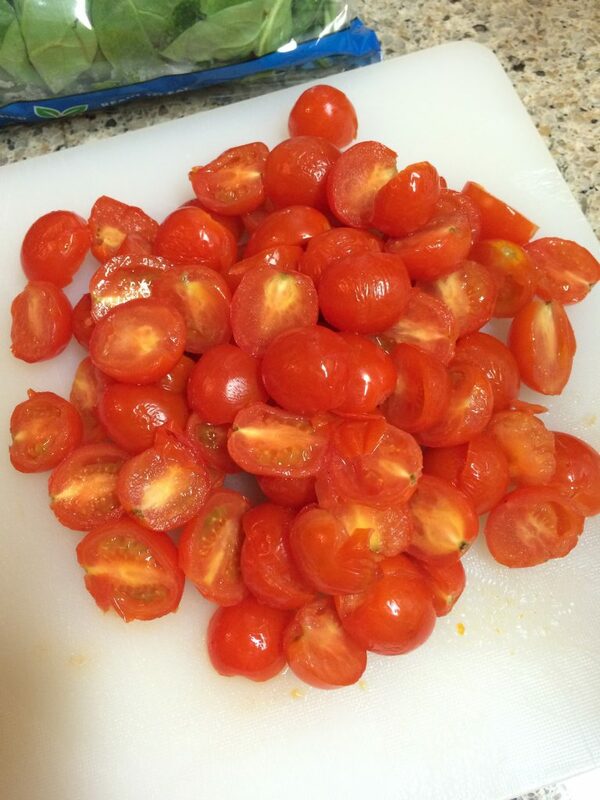 At this point the tomato should be perfectly cooked, warm to the bite but not mushy. Heat 5 to 6 quarts of water on high heat. 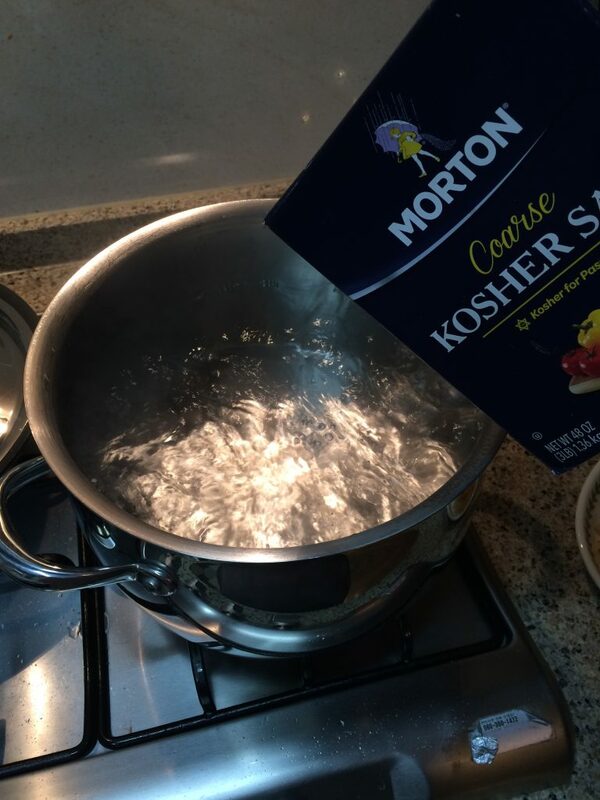 When the water boils, add salt. 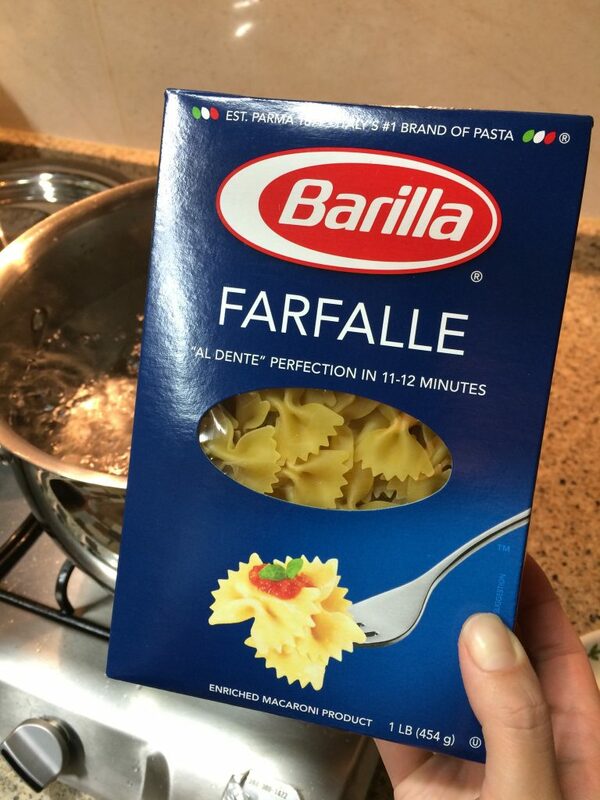 Add pasta, cook according to package directions. Preheat the oven at 375F degrees. Meanwhile, slice the chicken. 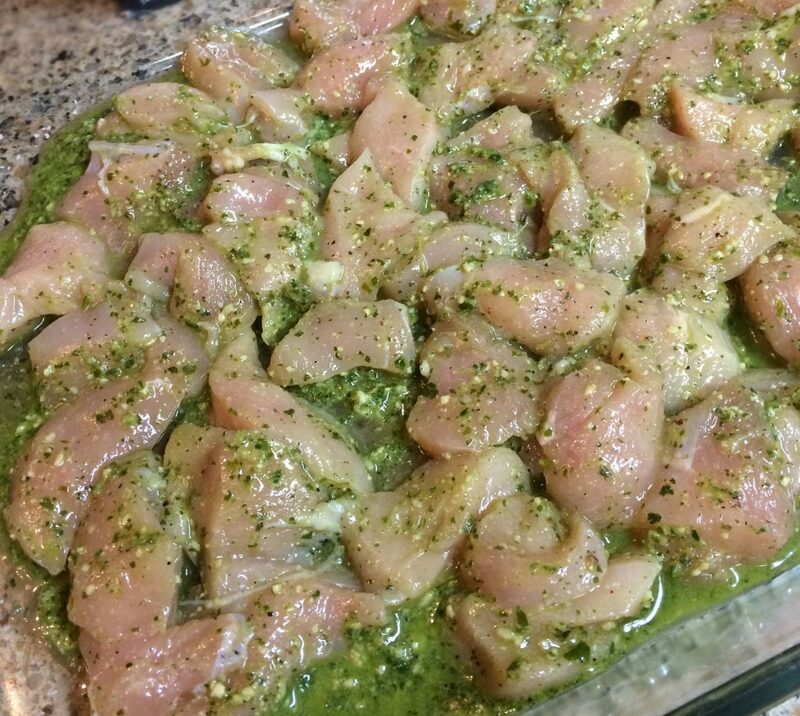 On a large glass baking dish, mix the chicken with 1/4 cup of basil pesto sauce. Bake in the oven for 15 minutes. 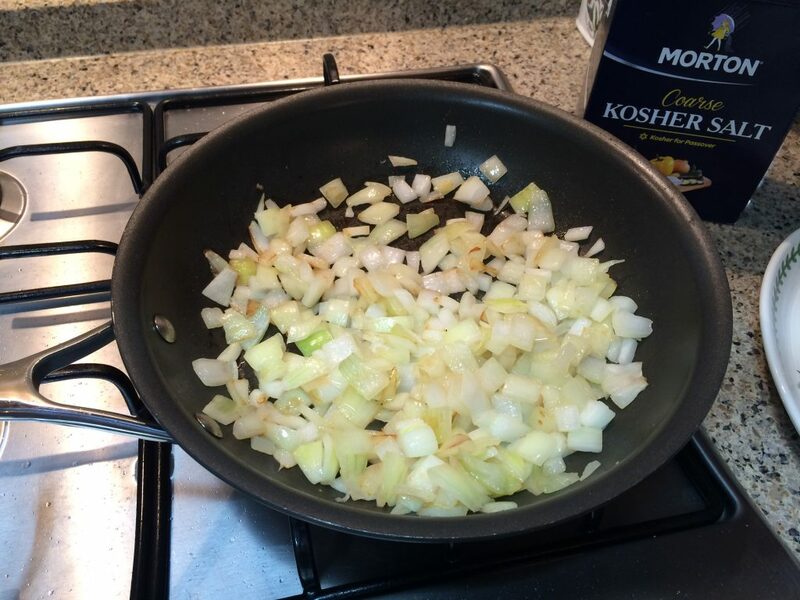 Dice onion and par-cook in a frying pan with olive oil, salt, and pepper. Par-cook spinach with hot water, but not boiling water. Strain off the water in colander. 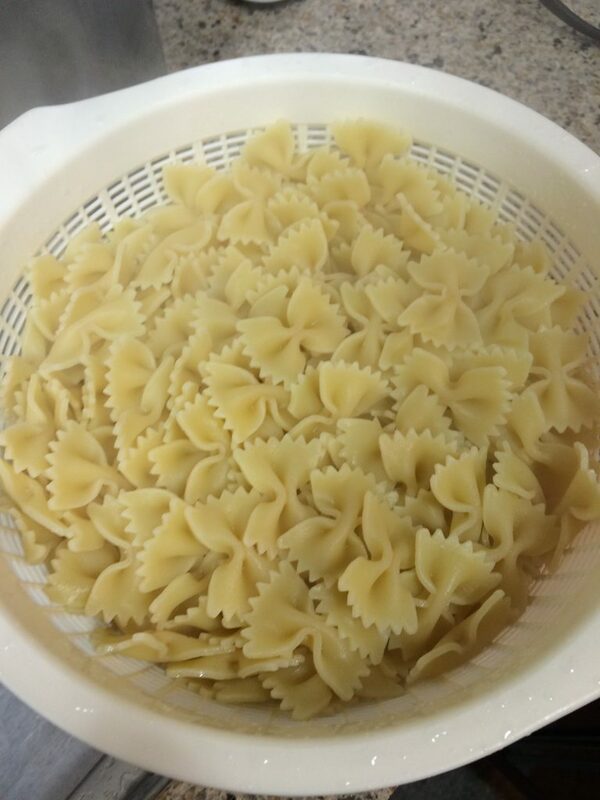 When pasta is finished cooking according to package directions, strain in colander. When the chicken is done, take out from the oven and put them in a large mixing bowl. Add onion, tomato, spinach, pasta, and rest of the basil pesto. Stir and mix everything together. Transfer the mixture to the large glass baking dish. Spread over the top with mozzarella cheese. Bake at 375F degrees for 15 minutes or until cheese has melted and turned golden brown. This restaurant quality meal is very simple to make. The key is to make everything precisely the way described in this article. Please read carefully about the crucial steps I discussed above before diving into the recipe. Also using homemade basil pesto sauce with this recipe will go a very long way toward making your meal even more delicious. Try to time everything to come together at the end. Boil the pasta while the chicken is baking. Add the basil pesto sauce at the end while ingredients are hot, this will make it easier to spread the basil pesto with the ingredients. 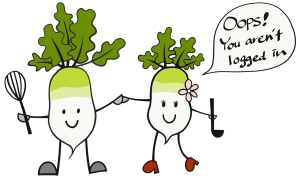 We love this recipe and we hope that you enjoy it too. It's important to try and time the cooking of the chicken, pasta, onion, and spinach to be finished at the same time. You want all of these to be hot when mixing together. This will minimize the time needed to bake in the oven.